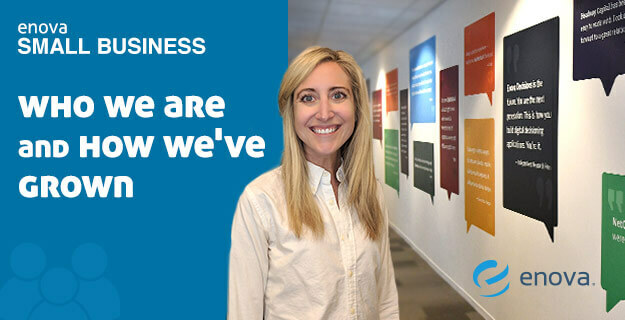 Enova Small Business: Who We Are and How We’ve Grown - Enova International, Inc. Your first question may be, “What is Enova Small Business?”. Put simply, it is two brands, with a singular shared vision to help hardworking small business owners gain access to the capital they need to thrive, by executing on a strategy that makes us the fastest and easiest lenders to work with in the marketplace. This strategy has been put in place because Enova SMB understands that for a small business facing a short-term cash crunch or looking to take advantage of a business opportunity, the ability to secure money quickly can be a lifeline. And if you ask, “Who is Enova SMB?”, I can tell you it’s a group of ambitious, innovative, fast-acting minds that work together across our Chicago and Cincinnati offices to create and drive the change and disruption it takes to yield success. It’s a collaborative group of people who care about what they’re doing, are accountable and driven by results, motivated by a good challenge and anchored in an ‘operate as an owner’ philosophy. Some of the people working within Enova SMB today actually helped to create and launch its two brands years ago. Headway Capital was born out of Enova in 2014, leveraging the world-class technology, analytics and customer service that had historically been used to build consumer-focused brands. It was launched to fill a critical financial market gap with a new, innovative-yet-familiar product that met the demands of today’s internet-connected world. Headway Capital was Enova’s first small business brand which offers a True Line of Credit up to $100,000, serving small businesses with everyday revolving access to credit, flexible terms, no prepayment penalty, daily interest accrual, and perhaps most importantly, a product they are familiar with and can trust – one just like a line of credit they’d apply for at a bank. Enova then acquired The Business Backer in 2015. The Business Backer was established in 2007 in Cincinnati, Ohio. While their flagship product is a merchant cash advance, The Business Backer provides small businesses with a relationship-based funding experience that allows for guidance and the delivery of multiple funding options from which they can choose. This product diversity and personal touch are differentiators in the marketplace. Last July, Enova hired Jim Granat as its Head of Small Business Financing. Jim brings market, partnership and operations expertise and has helped bridge the gap between the two brands. Previously the two brands operated separately, but under Jim’s leadership they have come under one umbrella. While they remain distinct brands that offer complementary products, the teams are shaped and acting as one, building upon existing synergies and leveraging one another’s best practices, strengths and insights through data. Ever heard of the concept, “Two heads are better than one?” That’s what we think, too. I’ll give you a good example. Decisions around credit risk, along with process speed and ease, are the keys to our success with both business customers and our independent sales organization partners. Being armed with double the insights from predictive analytics and partner outreach allows us to move swiftly to optimize decisioning capabilities and scale a reliable, fast and easy customer and partner experience. I’m proud to work on something as unique and ambitious as Enova SMB. Providing hardworking small business owners the funds they need to expand their business allows our team to truly make a difference in peoples’ lives. Small businesses are the cornerstones of the community, and I’m excited to see how many more we can help to develop and grow. Want to be part of the team? Apply here for Chicago opportunities and here for Cincinnati.